Those of you who have endured my rants over the years will know that I just don’t get it. Life that is. I don’t get Christmas; I don’t get marriage; I certainly don’t get funerals. I don’t get cars; I don’t get jewellery; I don’t get food, especially pretentious food. The list goes on. I quite like tattoos though. And that frizzy hair that young women promoting discount sofas tend to have. Very nice. Overall however, I struggle to make sense of the world and its human inhabitants. Against this backdrop I gravitate towards the work of those who do get it, or at least who can articulate the superficial and the futile better than I can. I love for example, the writing of Jim Crumley, a Dundonian with an acute eye and appreciation for the mechanics of Nature. His latest book, The Eagle’s Way, is by far my favourite and is a read I would thoroughly recommend to anyone with an interest in Scotland, eagles – golden and white-tailed – and the future. 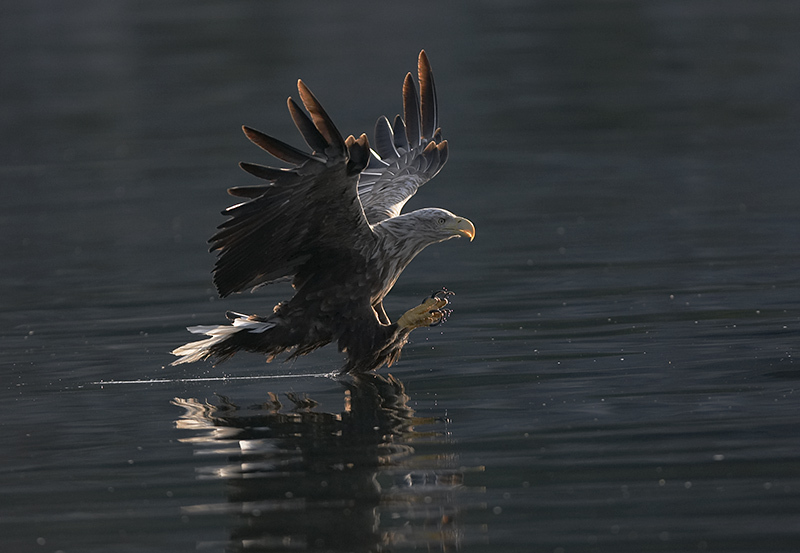 The book charts the return of sea eagles to Scotland, the reintroduced west coast population now joined by young birds brought from Norway and released on Scotland’s eastern seaboard. Jim relates stories of his many years watching golden eagles and more recently, his observations of the interaction between the two “eagle tribes” as they reacquaint after so many years. The writing is founded on logic, reason and insight. It is also a very moving read and that’s what makes it for me. I’m not ashamed to admit that I shed a few tears of regret, pride and hope, often all at once. Watching eagles, knowing about eagles, hoping on behalf of eagles: it’s emotional. “We learn about and understand other creatures only by living with them, not by taking the word of the loud mouths and small minds of those vested interests who would shout us down and have us believe that Scotland cannot accommodate those creatures their predecessors cleared from the land. Scotland can. The land can and the people can. We learn by living with them. We make adjustments and so do they”. Jim gets it. I don’t mean the trivial stuff that plagues my thought processes: he gets Nature. He gets our place within it and our responsibility to it, to ourselves. “Most of us think of ourselves as living apart from nature, but the other creatures of nature think of us as a part of nature. They see us as powerful and unpredictable, sometimes lethal and sometimes generous, a senior presence in the land and at times a formidable predator”. There are many books that have helped shape my values in the last few decades and this is right up there. Buy it and be moved. Absolutely one of my favourite authors, so perceptive, and writes beautifully……somehow manages to articulate those almost indescribable magical moments of connection with places – landscapes and their wild inhabitants – and makes me feel that I am sharing them with him. Paul, shame on you! Doesn’t it occur to you that authors are the ones who suffer most from discounted books? Do you really value books like this so little that it’s important to you to save £2 or whatever on an already cheap book? What DO you think is worth paying full price for? I can’t imagine the authors get a larger share from the Amazon behemoth, as linked in the article, than Foyles. (See the ongoing Amazon-Hachette dispute). For what it’s worth, the prices have shifted and Amazon is the cheapest again. But I’ll namecheck NHBS where it’s going at the RRP. What DO you think is worth paying full price for? It’s not your normal ‘nature book’ and all the more impressive for it. Ps Jim Crumley is magic!